One of our proprietary technologies is the DXDrive™ circuit - a mature design with an outstanding performance and reliability record. 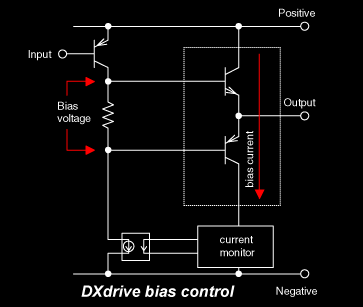 The DXDrive™ effectively overcomes a major challenge in most transistor-based linear amplifier designs: dynamic bias shift and the associated "thermal" distortion. Transistors need bias to operate in a linear mode. The amount of bias required to maintain their operating point constant is dependant on temperature. Output transistors typically generate varying amounts of heat, dependant on momentary load conditions, causing a corresponding change in their temperature. This makes optimal biasing a challenging task. 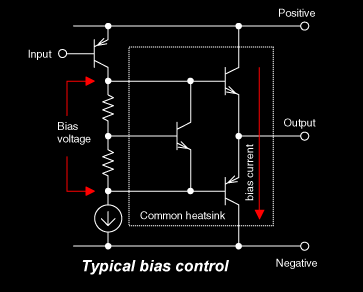 Classic circuits attempt to provide and control bias by employing some form of thermal feedback. Component manufacturers have gone as far as to include a dedicated diode for thermal sensing inside the transistor package. While this setup may work well under static load conditions, it has little chance to keep up with the dynamic thermal stress that power transistors experience in most real world applications. As a result, the momentary amount of bias can be either excessive or insufficient, leading to an increase in distortion. It is worth noting that this type of distortion is hard to measure in a standard setup, where an amplifier is provided with a constant sine wave signal and loaded with an active load - a resistor. Music is not a constant sine wave and loudspeakers are not even remotely close to resistors in terms of their electrical parameters. The DXDrive™ operates on a fundamentally different principle. It does not use any form of thermal sensing. Instead, it monitors the idling current directly, adjusting bias dynamically to maintain it at the optimal level regardless of temperature, supply voltage, or load variations. The result is near-perfect control and reduced distortion at any output power level.